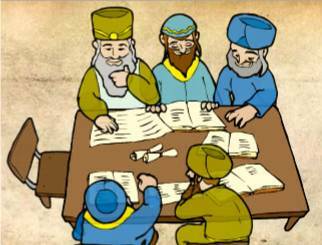 This year Purim starts with the reading of Megillat Esther tomorrow night, March 23. It is read again on Wednesday morning, March 24. We wish a Happy Purim to all of our Jewish Humor Central readers. We hope you enjoy this special Purim spoof from the Purim 2016 issue of The Kustanowitz Kronikle. You can download the PDF by clicking HERE. Print it and share it at your Purim Seudah. And coming tomorrow - Part 2 of our Purim spoof: THE KUSTANOWITZ KIDS' PICKS FOR THE 2014 SILVER GRAGGER MOVIE AWARDS. FAIR LAWN, March 23 – In the midst of the continuing struggle of the free world to defeat the armies of ISIS and Al Qaeda, a startling discovery was made last week in an Iraqi cave. A team of archaeologists digging alongside Kurdish Peshmerga near the Turkish border discovered a cache of scrolls that included the long-lost Talmudic tractate VOTIN, which details extensive discussions of the laws of planning and running elections. Talmudic scholars are fascinated with the implications of the find, as the reasoning of the sages clarifies current issues relevant to the highly contested and greatly anticipated elections in the United States in November. The academic world has long believed that this tractate existed but were stymied in the search until now. This new volume joins its companion volumes, all parts of the Talmud Baghdadi, which were discovered in the 1991 bombing of Iraq and in the subsequent search for weapons of mass destruction. PATCHEN - The laws of child discipline Another volume, SHTUPPIN, is still being deciphered, with experts uncertain whether it is about the laws of pushing an allegorical work alluding to more intimate behavior THE TALMUD BAGHDADI: A Sample Page From Tractate VotinMISHNA: How does one choose a candidate when all of the choices are bad? One holds one’s nose and casts the ballot. From what time is it permitted to cast a ballot? From the time that the final poll numbers are posted by CNN and FOX. How long is it permitted to wait in line to vote? Not too long, because idle chatter while waiting could lead to mixed dancing.GEMARA: The Etzba B’Af asks: How long should you hold your nose? Only as long as it takes to pull the lever. The Punkt Farkert disagrees and says as long as you are in the voting booth. The Grobber Yung says that it depends on the size of your hand and the length of your fingers. And you know what they say about a man with a big hand. A man with a big hand is likely to have a big nose. And a long nose may have to be held longer to complete the voting process.The Ohf Hagadol asks: How long should the voting booths be open? The Groisser Fresser gives his opinion that it should be at least as long as it takes for an elephant to cross the Euphrates River. The Regel BaPeh asks: How long is that? The Rodef Kesssef replies: About twice as long as it takes a tiger to cross the Tigris River. MEET THE SAGES OF THE TALMUD BAGHDADI We have learned much from the pages of the Talmud Baghdadi, but few of us know the sages behind the pages. Here are some brief profiles of the sages quoted in the excerpts from Tractate Votin and the other volumes:The Groisser Fresser was one of the biggest of the sages, literally. His positions were strict, but he tended to be more lenient in is opinions whenever they served to permit the consumption of more food.The Punkt Farkert was a regular opponent of the Groisser Fresser, and took great pleasure in refuting every one of his arguments.The Etzba B’Af was widely known for his penetrating analysis, but did not have many friends because of a lack of personal hygiene.The Regel BaPeh had an uncanny ability to offer soundly reasoned arguments, but somehow tended to use them to undermine his own position.The Ohf Hagadol, always one to seek compromises and find peaceful solutions, was the tallest of the sages but his skin had a yellowish cast, with an almost feather-like texture.The Grobber Yung, as wide across as the Ohf Hagadol was tall, made his mark by barging in to discussions among the more revered sages, punctuating his remarks with obscure references.The Rodef Kessef had a sharp mind for business, and always managed to voice opinions that maximized his financial opportunities.Wishing you a happy and joyous Purim. May the laughter of Purim resound throughout your home on Purim and all year long.